It has been replaced with a new one and the condition has improved. The old ones are cleaned and kept as spares. This review is about item#64024405. Scheduled cleaning every 5000 km. As a reserve for replacement if necessary. Although it was cleaning every 10,000 km, it has reached 70,000 km and it is replaced with a new one. Manufacturers do not designate periodic exchanges, but they are carried out with self-satisfaction and self-responsibility. I like the best engine, I want to continue riding for a long time. I bought it with what I had on the vehicle and planning to use it in rotation. I replaced it with 50,000 kilometers, but I feel that the knock when departing with a half clutch has decreased. There was no noticeable change in idling and acceleration. Since there was an introduction at Minkara, I tried to exchange it at 51,000 km. As a result, the engine became smooth (feeling that the colorless sound was reduced). It may be reasonable because it was a terrible carbon adhesion when looking at the removed sensor. The value of exchanging is great. It was exchanged at 7 thousand kilometers before, this time it is 14 thousand kilometers and it is an exchange. I can feel the change in engine response. I regularly remove this part and clean it, but I purchased a spare in case of emergency. It happened to happen, but it was very helpful to have it shipped the day. Replace sensor soon soiled. Is the same as the current one and the model number? Because the design of the character array was changed, I was surprised mistakenly that I made a mistake. Early exchange in own usage situation. As it was covered with soot as a result of repeated confirmation at 4,000 kilometers, slight ride, warm-up, idling, stop & go repeated, I was scared of sensor breakage and so I exchanged at 8,000 kilos, even if the rattle sound is quite small even when cold became. 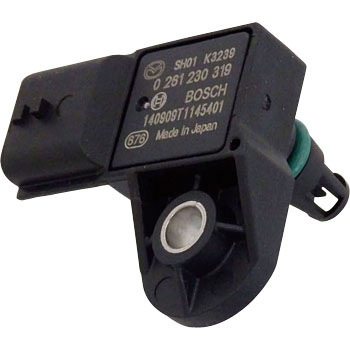 It is contamination of this sensor that was getting into the topic as one cause of engine malfunction on the Internet. Reaction with no problem as to dealer etc confirmed the truth several times. The mileage has reached 53000 km. Unexpectedly removed from the engine and I saw the degree of soiling It is almost packed. I tried cleaning with a toothpick or a cotton swab but now it is one. So it was relatively inexpensive and replaced with a new one. Variations in idling and carcass sounds during acceleration decreased. Ideal for spare after traveling thousands of kilometers. Soot adheres such as sludge and regular maintenance is satisfied with this. Purchased for maintenance of own car. After replacement, the diesel engine became lighter.